I’ve lost count how many copies of Zoso I’ve had over the years, but if there is one album that you should always have on hand, it’s this one. Sorry Cardi B…maybe next time…or not. Is there really anything better than Led Zeppelin IV? I’m sure many people could list several things that are, but me, I’ve been in love with the album since high school. Yea, ok…I don’t need to hear Stairway to Heaven anymore, but I will never tire of listening to The Battle of Evermore, Misty Mountain Hop, Four Sticks, Going to California, and When the Levee Breaks…’cause John Henry Bohnam. That Jimmy Page guy was a pretty good guitarist and a heckuva producer too. Robert Plant and John Paul Jones were jeez…I think they still get work from time to time because they were pretty talented too. All I know is that it was good to hear this disc again…it was like…coming home to my past, while hearing strains of an unknown future as I meditated on the plane of all that will ever be. Wow! Reiki! That was pretty good… Maybe I AM spiritual. I was also in the mood to swing, so I was looking around and I found this very mysterious album by one of my favorite jazz guitar players, the incomparable Barney Kessel. I wrote about Barney here and here and he is actually one of the more popular search terms to get to this blog. It’s great to know that there are a lot of Barney fans out there because he was one of the greatest guitar pickers that ever was. This album, Blues Guitar, is an odd one, for sure. Not one of the more well-known Barney offerings, it also has an interesting selection of songs: How High the Moon, Willow Weep for Me, Honeysuckle Rose, Out of Nowhere, Blue Moon, Limehouse Blues, and It Don’t Mean a Thing(If it Ain’t Got Swing) are all great swing standards and they feature the great Stephane Grappelli. Who knew these guys recorded together? Not me that’s for sure. Of course if you’re a Django Reinhardt fan like I am, you know Grappelli after about 3 notes and he brings his usual je ne sais quoi to the sessions. Barney is on fire as usual with this fleet-fingered chord melody and snaky, inventive single string lines. When he and Stephane trade-off on many choruses there are some totally frenetic and kinetic fireworks to be heard. Rockin’!! I mean Swingin’!! I also like the texture songs, Aquarius and Burt Bacharach‘s The Look of Love. What is very interesting is that a very small part of Barney’s guitar from this tune was sampled for a hip-hop track, The Look of Love, by Slum Village. Because of the exposure this group gave the song, Barney’s version is a thing with young guitar players who have learned the sample. Pretty cool if you ask me and good lookin’ out on Slum Village for sampling a class act and great guitarist! Finally, I picked up the alternative guitar classic from 1984, Aerial Boundaries, featuring the absolutely mind-boggling Michael Hedges. How mind-boggling was Michael Hedges? Er…maybe Davey Graham, Pierre Bensusan, Edward Van Halen, and Leo Kottke all rolled into one, with a dash of Allan Holdsworth. I had this on LP back in the day and a club we used to play jazz at featured this between sets regularly…’cause it just has that sound: lovely textures, outside the box guitar tunings, percussive slap and hammer-on fingerpicking and strumming. This album was very influential for its time and what Hedges crafted as a style and way of approaching the guitar that still influences people today. Have a little watch and listen below to the title track. The whole album has a deep guitar ambience that I love and it perfectly completes my amazing guitar music purchase trifecta for the month. Enjoy what’s left of the summer! Amazing the things one learns through the power of the internet doing research for silly articles. After finishing this post on Led Zeppelin’s interviews in Guitar World back in the day, I learned that Robert Plant’s mother is from the Roma community. That explains a lot. Don’t you think? GQ: After all these years, how on earth have you managed to keep your hair like that? Robert Plant: Well, I don’t know. We could be quite serious about it. I just have been very lucky. My mother was a gypsy, and she had a lot of dark blood in her, and her hair was very, very thick—she couldn’t even get a brush through it. So I have been very fortunate. And every time I go to cut it off, hairdressers refuse to do it. It looks like I am not the only person who thinks more people were interested in t-shirts as far as The Ramones were concerned. 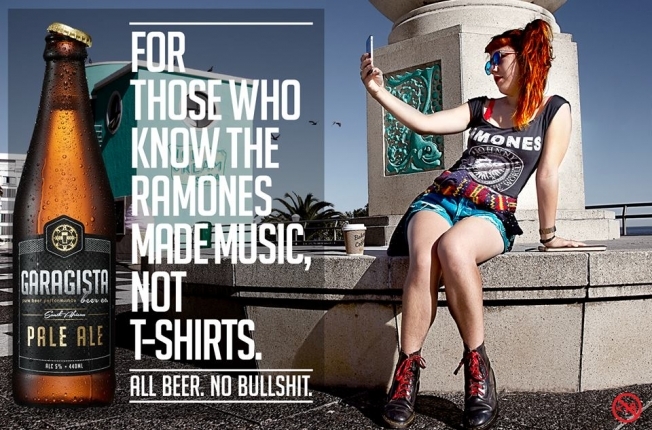 (Hahah) This is part of an ad campaign using the reverse psychology thing to get hipsters to buy beer…or something. Does the world really need another craft beer? Seriously? I didn’t go looking for this, it just kind of appeared this morning…But the lesson here is Buy the discs people… t-shirts fade, get holes and fall apart. CDs and Mp3s are forever and even vinyl lasts a long time if you don’t pass out at a party and leave it up against the heater. Listening to Johnny Ramone muse about how The Doors might be the greatest American rock band ever I decided to revisit their music. Of course I have heard all of this stuff over the years and you know what? It still holds up. The best? I dunno if I can go there, but when Jim Morrison was semi-sober and into it these guys were pretty flippin’ good. They were also very influential in the same way the Ramones were. Just ask Billy Idol or Iggy Pop. I remember when I bought this record, in late 1979, at this cool record shop located in a strip mall. I was driving around with a soon-to-be ex from high school and we just stopped in to browse and when I saw the cover of The Ramones I thought “well this looks interesting.” The soon-to-be ex wasn’t nearly as enthralled, especially once we heard it. Released in 1976, The Ramones’ eponymous debut has been heralded as genre-defining and immeasurably influential and it only took 38 years for it to reach GOLD status. I know my first copy of the disc lasted a little over a year. I took it and a stack of other albums to a party and left them up against the electric heat vent in the room. Needless to say it was unplayable after that. I bought another copy that lasted much longer, but I guess a whole lot of other people didn’t follow my example (of buying it, not leaving it against a heater). While I was aware that The Ramones never had the numbers to compete with Led Zeppelin, Garth Brooks or Michael Jackson, I was actually quite surprised that the record wasn’t already gold. I bought 2, so that means only 499,998 more had to be picked up by people over the years and you would think that for all the people who have raved about and praised the band for their importance, the disc would’ve moved. There was a point in the East Village, NYC (1989-91) when it seemed like every other person was wearing the classic Ramones t-shirt. It was a very trendy fashion identifier for the grunge/punk era in NYC. Kind of like beards are now. I wonder how many Ramones shirts have sold since 1976? Maybe more shirts than records? Perhaps this is a lesson in perceptions or perhaps what the band represented to many people was more important than their actual music. The Ramones were very pragmatic in their approach to getting a band together and this process served as a blueprint for thousands of bands that followed. They also defined (to music writers and fans) the very egalitarian ethos that anybody can do it. Pop and Rock music was ripped out of the country estates, private jets and huge arenas and brought back to the streets. Emerson, Lake and Palmer were guillotined in the press, Led Zeppelin went to see The Dammned in concert and Elvis Presley died because he couldn’t compete with Sid Vicious. The era of rock stars as ROYALTY was over! Hurrah! It’s interesting that in this interview Johnny talks about how he thinks The Doors were one of the best American bands. Many people who would end up being fans of punk rock and numerous music writers viewed punk as an alternative to anything that smacked of the old guard, but the musicians didn’t necessarily feel that way. Rock writers have always had this love affair with early rock and roll as the almighty pinnacle of rock’s artistic achievements. “The music never had to evolve past Bill Haley and the Comets or Eddie Cochran…that was the real deal maaaan!” Which of course is silly. Very few of these writers would want to be diagnosed with cancer and have the doctor start applying leeches. Not only did music evolve because different people brought different influences and abilities to the table, but technology expanded the scope and scale tremendously. (Watch a Zeppelin video from the 70s and then watch a Beatles video from the first tour only 9 years earlier and consider only the technological differences) Changing social attitudes and the vibrant energy of each new generation continued to up the ante of what was possible — this is what humans do with everything. Why would rock and roll be any different? Here’s an exchange in a Johnny Ramone interview from 2003 that is an amazing bit of synchronicity given the profile I just did of Jimmy Page’s guitar opus Dazed and Confused. Jones: A lot of punk and speed guitarists owe a lot to you. But, who inspires you? Ramone: Jimmy Page, of Led Zeppelin. He’s probably the greatest guitarist who ever lived. Jones: Jimmy Page! That’s the last reply I would have expected to hear. Jones: It’s ironic: Almost every blurb I read explaining the appeal of the Ramones chalks it up to you guys reintroducing straight tunes in 4/4 time, two minutes, a return to the kind of stuff the Beach Boys or the girl groups from the early ‘60s recorded. That the Ramones were the antidote to the fifteen minute-long “concept rock” stuff from groups like Led Zeppelin. Ramone: The Ramones were never anti-Led Zeppelin. Maybe “anti-groups-who-just-aped Led Zeppelin.” Everything in the ‘70s was moving towards all that. FM radio was promoting an album rock format. We wanted to record something kids could dance to. But, Jimmy Page: His playing is truly amazing. I could never play at that level. I don’t try to imitate him, but I listen to him a lot. While I have known some Ramones fanatics over the years — they had the shirt AND the records and loved the band immensely — in the late 70s and early 80s most people looked down on punk music and thought it was stupid. But at parties even die-hard haters enjoyed listening to Beat On the Brat and Texas Chainsaw Massacre, sometimes while jumping around like lunatics. Even if one couldn’t take it seriously as an art form it was great fun when it was time to let loose. In my early days as a guitar player I was a chord strummer and not much else. I kind of sucked. Later, I started hanging out with people who played guitar really well and while their favorite bands were Zeppelin, Sabbath, AC/DC and Rush, they all liked playing the Ramones and other punk rock for the same reason. It was great fun!! (It’s also much harder to pull off a great 20-minute version of Dazed and Confused at that age). One of the first lead guitar lines I ever played was the break in Now I Wanna Sniff Some Glue. It was in my friend’s basement and there were maybe 10-15 people there drinking beer and it was awesome. I had gotten a Peavey 50 watt amp over the Christmas holidays a few months before and I played Glue and the intro to Whole Lotta Love over and over. Throughout my life my musical tastes and guitar abilities have been completely intertwined and related. As my abilities grew and my ears expanded I have continually sought out new horizons for both my ears and my hands. I think this is true of many people, musicians, artists, parents…Because of this reason, and as I explained in this post, I was never a total 100% punk rock fanatic. Those people are a special breed and I admire their dedication and commitment. I played in a few punk bands over the years and saw loads of punk shows and had lots of fun, but have always played (and listened to) many other styles of music. Living in the neighborhood that was the birthplace of The Ramones allowed me to see the whole thing from a unique angle and participate in some of the excitement and good times and for that I will always be grateful. It’s a shame that Johnny, Joey and Dee Dee didn’t live to collect their Gold Records. They certainly earned them. They were idols of an era that has passed, but lives on every time a group of youngsters or oldsters count off a fast 1234 and blast headlong with abandon into a 2 minute rock and roll anthem.